From the writings of Aristotle and Galen to the 20th century skepticism of Popper, the history of science has been given shape by monumental achievements in writing. These books —Galileo’s Dialogue, Newton’s Opticks, Lavoisier’s Elements of Chemistry and many more — have served as milestones which changed the course of human affairs. 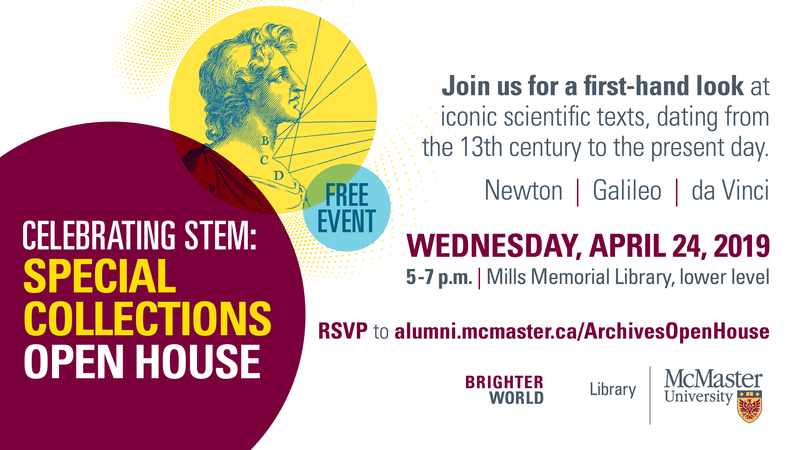 Join McMaster University Library for a first-hand look at these and many more iconic scientific texts from our extensive collection, dating from the 12th century to the present day. When: Drop in onWednesday, April 24, between 5:00 p.m. – 7:00 p.m. This event is part of a a special year of programming aimed at celebrating the ways in which the Library supports research, teaching and learning related to Science, Technology, Engineering and Math (STEM). Events are presented in partnership with the Health Sciences Library and the Faculties of Science and Engineering.